Congenital coronary-pulmonary fistulas (CPFs) are defined as an abnormal direct communication between one or more coronary arteries, with a cardiac or thoracic structure bypassing the capillary network. CPFs represent rare anomalies with an incidence variable in echocardiographic (0.06–0.2%),, necropsy (14%), and angiographic studies (0.1%–0.67%).,,,,, Despite the described secondary forms (following chest trauma, complications of left main trunk procedures, or CABG), congenital forms represent the majority. Dyspnea and chest pain may be a frequent complaint in adults with CPFs, while, in the pediatric age group, the majority of cases are silent. The most common coronary artery of origin for CPFs is the left main/left anterior descending, followed by the right coronary artery. CPF most commonly terminates in the main pulmonary artery. The majority of CPFs are single (unilateral) communications, but bilateral (dual) fistulas, and multilateral, triple, and quadruple fistulas have been previously described. We report the case of a 73-year-old male, with a history of hypertension, asymptomatic for angina and dyspnea, who was referred for routine clinical control. Physical examination was normal, and electrocardiogram showed a sinus rhythm with left bundle branch block. Echocardiographic examination revealed normal left and right ventricular dimension, but a moderate left ventricular systolic dysfunction (ejection fraction 40%). Unexpectedly, parasternal short-axis view showed the presence of diastolic flow from the pulmonary trunk upward [Figure 1]a. The ostia of the left and right coronary arteries were therefore carefully examined to assess their exact origin from the aorta or pulmonary artery. Pulsed-wave Doppler confirmed the presence of diastolic flow and displayed the typical coronary flow pattern [Figure 1]b. Therefore, a CPF was suspected. The patient was thus sent to cathlab for coronary angiography that showed the presence of dual CPFs originating from the second segment of the left anterior descending coronary [Figure 1]c and the right coronary arteries [Figure 1]d. Clinical and echocardiographic follow-up showed progressive reduction of systolic function, however, with a left ventricular ejection fraction >50% and effort dyspnea. Although the occurrence of congenital CPFs is rare, such anomalies could be the cause of different clinical conditions such as chest pain, exertion dyspnea, palpitations, and angina. Echocardiogram is an important tool for the detection of CPFs; when compared with coronary angio or angio computed tomography (CT), it is much simpler, easier, less expensive, safer, repeatable, and accurate. Occasionally, echocardiography could be the first-line method for the diagnosis of suspected congenital coronary artery fistulas. Echocardiography can show the presence of dilated coronary arteries and ventricular chambers and a variety of associated congenital and acquired heart defects. In a case series from Vitarelli et al., transthoracic echocardiography was suggestive for the presence of coronary artery fistulas in 33% of cases and transesophageal echocardiography confirmed the diagnosis in all patients. Of course, the diagnosis of CPF must be always confirmed by coronary angiography or coronary CT that may not only eventually confirm the presence of CPFs, but also more clearly define the whole fistula characteristics (origin, pathway, and outflow) and identify possible complications. Echocardiography, ideal for first-line assessment, should be included within a multimodality imaging approach, especially in the differential diagnosis of CPFs, a potential challenging task. Careful routine Doppler echocardiograph examination may raise the suspicion of CPF in case of otherwise unexplained symptoms and may represent a simple, easy, repeatable tool for the first suspected diagnosis and follow-up of CPFs. Said SA, Nijhuis RL, Akker JW, Takechi M, Slart RH, Bos JS, et al. Unilateral and multilateral congenital coronary-pulmonary fistulas in adults: Clinical presentation, diagnostic modalities, and management with a brief review of the literature. Clin Cardiol 2014;37:536-45. Sherwood MC, Rockenmacher S, Colan SD, Geva T. Prognostic significance of clinically silent coronary artery fistulas. Am J Cardiol 1999;83:407-11. Hsieh KS, Huang TC, Lee CL. Coronary artery fistulas in neonates, infants, and children: Clinical findings and outcome. Pediatr Cardiol 2002;23:415-9. Angelini P. Coronary artery anomalies – Current clinical issues: Definitions, classification, incidence, clinical relevance, and treatment guidelines. Tex Heart Inst J 2002;29:271-8. Gillebert C, Van Hoof R, Van de Werf F, Piessens J, De Geest H. Coronary artery fistulas in an adult population. Eur Heart J 1986;7:437-43. Bhandari S, Kanojia A, Kasliwal RR, Kler TS, Seth A, Trehan N, et al. Coronary artery fistulae without audible murmur in adults. Cardiovasc Intervent Radiol 1993;16:219-23. 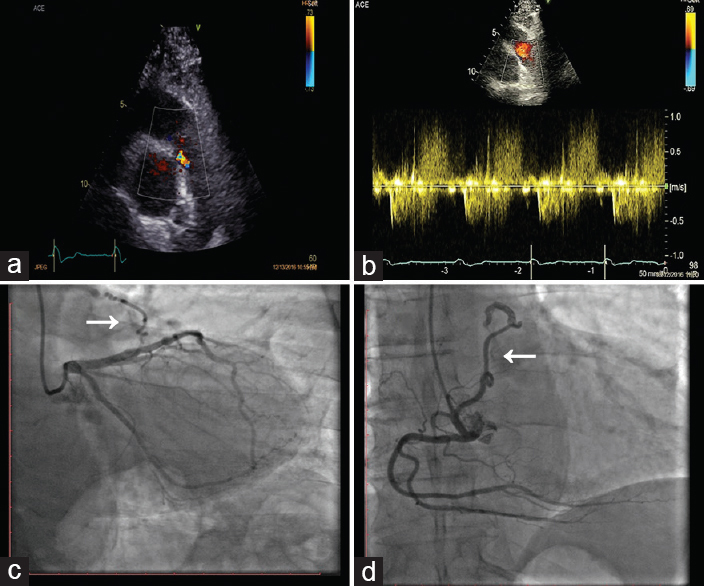 Said SA, el Gamal MI, van der Werf T. Coronary arteriovenous fistulas: Collective review and management of six new cases – Changing etiology, presentation, and treatment strategy. Clin Cardiol 1997;20:748-52. Chiu CZ, Shyu KG, Cheng JJ, Lin SC, Lee SH, Hung HF, et al. Angiographic and clinical manifestations of coronary fistulas in Chinese people: 15-year experience. Circ J 2008;72:1242-8. Said SA, Lam J, van der Werf T. Solitary coronary artery fistulas: A congenital anomaly in children and adults. A contemporary review. Congenit Heart Dis 2006;1:63-76. Mullasari AS, Umesan CV, Kumar KJ. Transcatheter closure of coronary artery to pulmonary artery fistula using covered stents. Heart 2002;87:60. Cheon WS, Kim EJ, Kim SH, Choi YJ, Rhim CY. Bilateral coronary artery fistulas communicating with main pulmonary artery and left ventricle: Case report. Angiology 2007;58:118-21. Takeuchi N, Takada M, Nishibori Y, Maruyama T. A case report of coronary arteriovenous fistulas with an unruptured coronary artery aneurysm successfully treated by surgery. Case Rep Cardiol 2012;2012:314685. Gundogdu F, Arslan S, Buyukkaya E, Kantarci M. Coronary artery fistula in a patient with coronary artery disease: Evaluation by coronary angiography and multidetector computed tomography. Int J Cardiovasc Imaging 2007;23:299-302. Fujii H, Tsutsumi Y, Ohashi H, Kawai T, Iino K, Onaka M, et al. Surgical treatment of multiple coronary artery fistulas with an associated small saccular aneurysm – A case report. J Card Surg 2006;21:493-5. Xie M, Li L, Cheng TO, Sun Z, Wang X, Lv Q, et al. Coronary artery fistula: Comparison of diagnostic accuracy by echocardiography versus coronary arteriography and surgery in 63 patients studied between 2002 and 2012 in a single medical center in China. Int J Cardiol 2014;176:470-7. Said SA. Current characteristics of congenital coronary artery fistulas in adults: A decade of global experience. World J Cardiol 2011;3:267-77. Vitarelli A, De Curtis G, Conde Y, Colantonio M, Di Benedetto G, Pecce P, et al. Assessment of congenital coronary artery fistulas by transesophageal color Doppler echocardiography. Am J Med 2002;113:127-33.